Use homemade buttercream or cream cheese frosting for these tasty bite-size cakes. 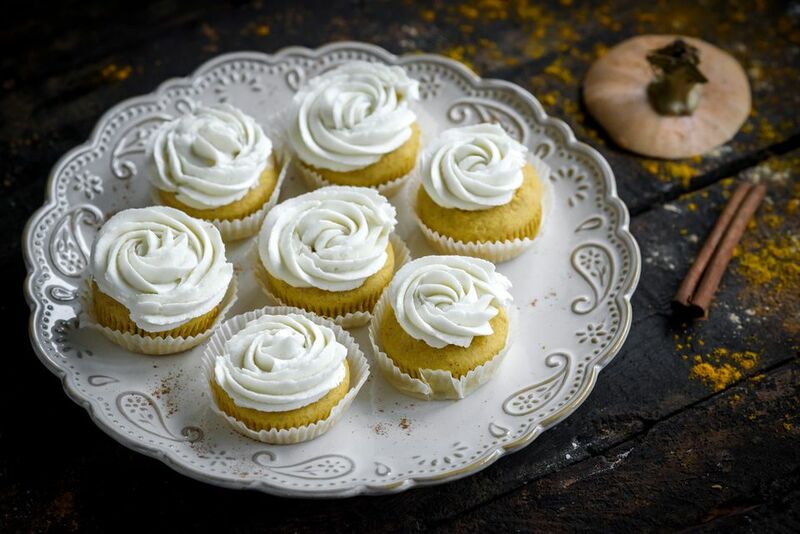 These cupcakes would be pretty as part of an autumn or Halloween dessert spread. Sift together the flour, baking powder, soda, salt, and spices. In a mixing bowl, cream together the butter and sugar, then add the egg, beating well. Add the dry ingredients, alternating with the milk, until well blended. Line two mini muffin pans with 30 to 36 mini muffin liners. Fill each lined cup about 2/3 full. Bake for 15 to 20 minutes, or until cakes bounce back when lightly touched in the center. Decorate with the frosting through a star tip, if desired, or frost with a spatula.